Although the DDR4 has been out in the market for a good while, we haven’t actually seen a healthy influx of DDR4 products in the market until recently. And the reason for this sudden emergence of the DDR4 is simple – the arrival of the INTEL X99 chipset, which finally creates a viable platform for the DDR4 to shine. Presently, DDR4-2133 is the most common specification for DDR4 memories in the market, with the DDR4-2400 poised to become the market standard in 2015. Memory product manufacturer KINGMAX has made relevant deployments to ensure that its DDR4-2133 and DDR4-2400 DDR4 products are ready for mass production and market launch. These products are fully compliant with JEDEC’s DDR4 specifications with bandwidths reaching 17.0GB/s and 18.2GB/s respectively. Coupled with strengths such as low CAS latency, the DDR4 should have no trouble replacing the DDR3 as the mainstream memory product in the near future. 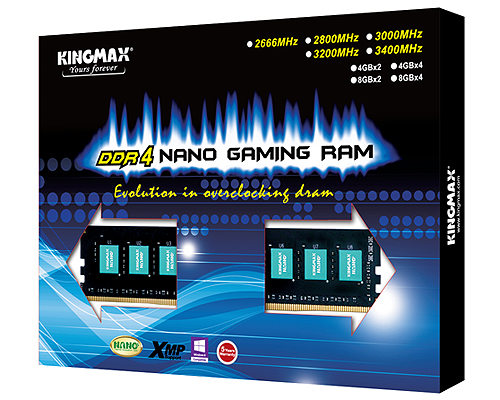 KINGMAX DDR4 OC also features nano thermal dissipation technology. The truth is, it takes nano-grade material of DLC and Si to achieve a simple and lightweight form design while reducing carbon footprint and keeping the consumption of virtual water in control, thereby allowing KINGMAX to adhere to its philosophy of green production in all processes. KINGMAX has also established that nano thermal dissipation technology can effectively reduce the working temperature of a system by 10%, rendering the technology more effective than the use of heat sinks and saving OC gamers from having to worry about the adverse effects of high temperature when they attempt to challenge the limits of the product. KINGMAX 288-pin OC DDR4 is available in a variety of specifications, including DDR4-2800/3000/3200/3400 with a maximum bandwidth up to 27.2GB/s. In addition to supporting Intel XMP 2.0, the product also allows users to make two sets of SPD configurations and try a variety of things with this function. Rumors on KINGMAX’s pricing for the product have also been released and the prices sound rather attractive, and apparently it won’t be too difficult to overclock DDR4-2800 to DDR4-3200. In short, KINGMAX DDR4 OC screams “must-buy”, no matter how you slice it.